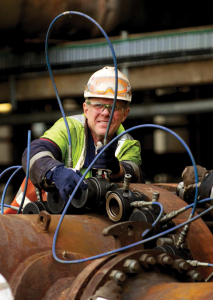 JOC & JOC LTD (JJL) assists clients in achieving their business objective of a safe and leak free work environment by providing appropriate flange management and control techniques. The integrity of bolt and flange connections is key to minimizing production downtime and environmental pollution. Our on-site Bolting & Machining expertise ensures that entire joint integrity process from inspection through to assembly, testing and completion are top in class. Our experienced, multi-disciplined technicians are fully trained and competent in the correct operation of the array of tooling and equipment offered by Atlas Copco Tools Division (Rapid Torc, Tentec) in the operation of the bolt integrity software package. JJL has full stock of bolting needs in our Port Harcourt Warehouse, ready to deploy to any facility within West Africa. 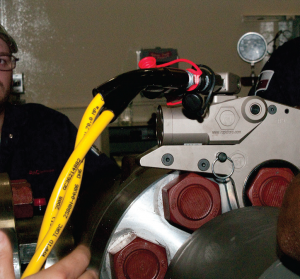 To ensure the standard and reliability of all tooling is maintained, a dedicated team of skilled workshop technicians are employed, specifically trained and competent, to maintain and calibrate all equipment in our rental / service fleet. JJL can use technicians trained on Rope Access trade to install bolting needs at remote locations and avoid erecting substantial scaffolding for the torquing and tensioning operations.